Fast and sure on the ice, Olympic gold medalist Apolo Anton Ohno was less sure about his ancestral background. 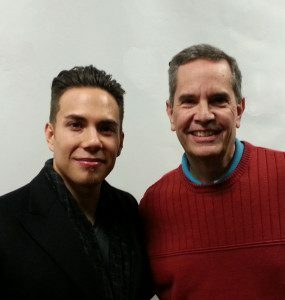 Olympic gold medalist Apolo Ohno and Extreme Genes radio host Scott Fischer. Raised by a single father, who’d immigrated to the United States from Japan, Apolo didn’t know much about his mother’s side of the family. On a recent episode of the syndicated family history radio show Extreme Genes, Apolo said he turned to 23andMe to find out more about his ancestry. Along with the eight time Olympic medalist, the show featured 23andMe product scientist Robin Smith, PhD, who highlighted some of the company’s ancestry features and tools. During his segment, Apolo explained that growing up outside of Seattle, he was sometimes asked about his nationality. “What are you?” is how the question was often asked. “I’m half Japanese, but they’d ask what’s the other half,” Apolo told the show host Scott Fischer. He didn’t know much about the other half of his ancestry. His mother and father had divorced when he was very young and he stayed with his dad. He didn’t have much contact with his mother and because she’d been adopted she really didn’t know much about her family history. But he was always curious about his ancestors, he said during the show. On his Japanese side, he had a rich source of family lore not just from his grandmother, but because it is custom to carefully catalog the family going back generations. There are extensive household registries called koseki, as well as death records and records compiled by families themselves that helped Apolo trace back his Japanese family history. On his mother’s side, he had very little to go on. That’s why he turned to 23andMe. He learned the other half of his ancestry was rooted in England and Ireland, which might explain that even though his hair is black, his sideburns and goatee are red. He also learned that he has a little North African ancestry. Apolo said his curiosity wasn’t just about learning about himself, but learning more generally about the human story. He mentioned reading about the discovery of 120,000 year old bones in China that change our understanding about the timing of human migration. “It’s awesome,” he said of the science. Before Apolo’s segment on the show, 23andMe scientist Robin Smith discussed some of 23andMe’s tools customers can use to explore not just their ancestry, but also their own connection to the human story. Robin, who started his career as a geneticist focused on spinal cord regeneration, works on writing health and trait reports for 23andMe along with helping the company’s ancestry team develop features. 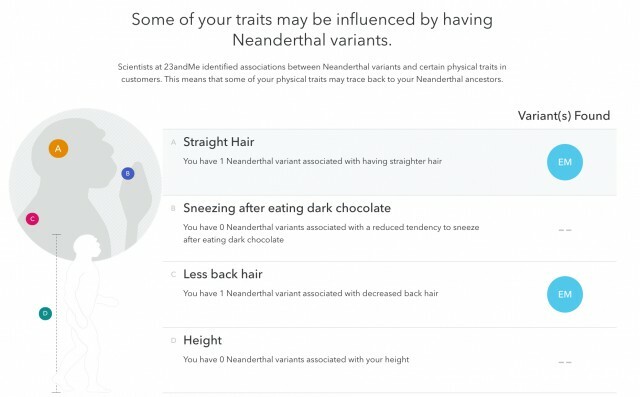 One of the projects Robin worked on is 23andMe’s new Neanderthal report. All humans outside of Africa carry DNA signatures of Neanderthals, a sister species to modern humans that went extinct about 35,000 years ago. Using new sequencing data, 23andMe can pinpoint where those Neanderthal variants show up in your genome, Robin said. The report also looks at the different traits some of those variants are associated with – back hair and height, for instance.